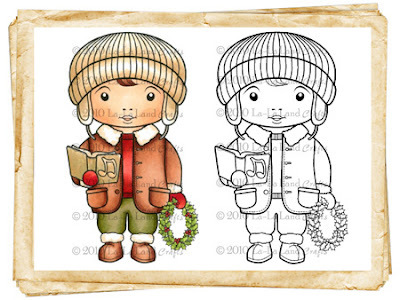 Caroling Luka He is ready to sing a Merry song with his song book in hand and a cheery wreath of holly! 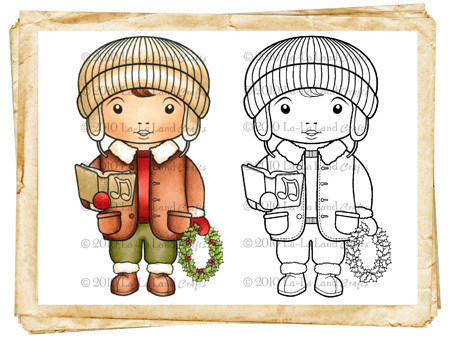 I knew the minute I laid eyes on this image I wanted to add texture to his coat, a thin coat of liquid applique did the trick! Isn't that fun? Looks like a warm woolly trim to keep him nice and toasty while he is caroling through the neighborhood! Trust me when I say that after a while you really become quite fond of these little cuties, they each have their own personality and come to life when you color them! La La Land Crafts for all of the details, but I can bet you will not want to miss out on this special treat! Please hop on over to La La Land Crafts blog to get started on your blog hop and to enter for a chance to win that amazing prize package! Good Luck!!! and as always, happy creating! I am in love with Luka, this is adoreable and love the puffy paint on his coat collar! I have 3 boys and this stamp reminds me of my oldest when he was little. This is just adorable Shantaie...love your coloring and that ribbon is perfect! What a beautiful card! I might just have to add stamping to my repertoire of scrapbooking supplies/tools! Very, very cute! You make some amazing cards and this one is no exception! It is awesome! Love the way you put your Caroling Luke card together. The wooly trim on his coat is great. This card is amazing! Caroling Luka is so sweet! Fantastic card! These images are so sweet and adorable that they certainly inspire creativity. Nice job of colouring and love your choice of dp and the layout. I love the card....Luka is so cute....Thanks so much for sharing your beautiful work! The card is really wonderful. I love the detail on the coat and boots, and that you added ribbon without making it girly. It's great! Love the puff paint accents! Very cute! super sweet Shantaie!! love your layout and colors! What a fabulous card I love the colors and the new image is so cute. Super sweet card! Love the colors you used. 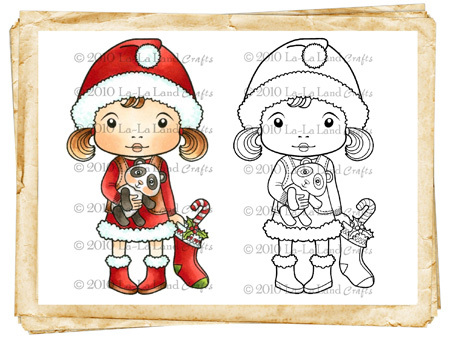 Love the cute new holiday stamps. What a delight! Beautifully colored! Love that ribbon! Love the added texture on his collar - gorgeous card! My gosh, so gorgeous! Beautiful coloring! All three new release stamps are just amazing. Since I collect Santa Claus, I think my favorite is Santa Marci. Love your Luka card. Those stamps are adorable. Thanks for the hop and giveaway! Love what you did with the collar and socks!! Very beautiful card and I love the colors too. Sweet card! I love all the layers and the trim! I love that fluffy all over Shantaie! He is so handsome and that ribbon and papers...so awesome!! Oh Shantaie, he's so handsome! You made such a wonderful card. OMG! This is simply great...Luka is absolutely adorable on this card!! You do an amazing job with your coloring and it really makes a difference in the end result! I am actually using the liquid applique for the 1st time on a card I'm making right now...hope it turns out as good as yours! Love all the extra details that you put on your Luka card. Just added to an already awesome card. Another beautiful card on this hop...thanks!! Love the wooly texture. Your card creation is just gorgeous! So many beautiful layers and LOVE the fur flock of the liquid applique! Fabulous! Wow!!! Awesome cards. Love the new releases. Great card! Luka is the cutest. I love your card - the white trim really sets it off nicely. He is adorable! I am LOVING the texture added to his coat! I'm going to have to buy these soon because I think I want them for my Christmas Cards this year! Oh Wow! Little Luka is darling!! 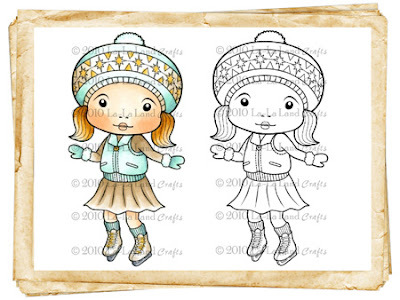 Your coloring is wonderful and the Liquid Applique is the perfect touch! Great card! These stamps are so much fun! Wonderful Card!!! love the fuzzy collar!